7 acre vineyard is on a steep grade, facing north-east, giving a distinctive taste of mountain fruit blended with a cooler growing aspect to the signature wines. 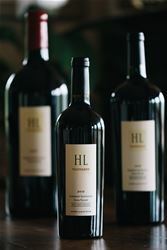 Less than 1,500 cases are produced each year, and the signature HL Vineyards Cabernet Sauvignon is sourced 100% from the estate. There is also an intimate Tasting Room located in St. Helena, which is open by appointment only for individuals and small groups. The Two Old Dogs Sauvignon Blanc, Two Old Dogs Cabernet Sauvignon, Two Old Dogs Rose and the signature HL Vineyards Cabernet Sauvignon wines are available for both tasting and purchase via the tasting room, as well as on-line on the website. Call or email for an appointment. Our private Tasting Room, open by appointment only, is situated in St. Helena, at 1080 Fulton Lane in the Acme Wine building. A cozy environment for parties of 8 or less, this tasting becomes an intimate experience to sit with the owner or manager and learn first-hand about the history, viticulture and winemaking practices of Herb Lamb Vineyards' wines. Food Available: A selection of seasonal fruit (sometimes grown on the vineyard property) and local California Artisan Cheese members' cheeses will be presented to accompany the wines. Herb Lamb Vineyards is certified under the Napa Green Winery Program by the Napa County Department of Environmental Management (DEM) and the Association of Bay Area Government’s (ABAG) Green Business Program and completed all the regulatory components needed for environmental sustainability. These components included developing water and energy conservation methods, preventing pollution, and reducing solid waste. In addition to developing sustainable winery practices, this program is set to become the standard for the state of California. Herb Lamb Vineyards is certified under the Napa Green Certified Land Program. Herb Lamb Vineyards has created and implemented a customized farm plan with measured results that addressed all aspects of its property, vineyard land as well as non-farmed land, including practicing soil conservation, water conservation, stable drainage, riparian corridor enhancement, fisheries and wildlife habitat enhancement and long-term improvement and sustainability.